There's something indelible about Rain Man, and not only to those of us who lived through the time when it was a zeitgeist movie. 140 min. MGM/UA. Director: Barry Levinson. Cast: Dustin Hoffman, Tom Cruise, Valeria Golino, Gerald R. Molen, Jack Murdock. A crazy plot and an odd couple converge in Barry Levinson's Rain Man, a runaway success that scored Oscars for director Levinson, actor Dustin Hoffman, screenwriters Ronald Bass and Barry Morrow, and producer Mark Johnson, the face of the film's Best Picture win. Though the road-trip story is paper-thin, Rain Man succeeds as well as it does by playing with our expectations about that textbook term "character arc." The hotshot proprietor of Babbitt Collectibles, Charlie Babbitt (Tom Cruise) is a familiar '80s archetype, a "master of the universe," or his universe, anyway, until twin crises shake his self-made foundation. First, EPA intervention causes a cash-flow problem threatening his trade in rare autos. Just when he needs his full focus, Charlie learns that his estranged father has passed, necessitating a trip home from L.A. to Cincinnati. There, Charlie discovers that most of his father's assets have gone to a brother Charlie forgot he ever had: Raymond (Hoffman). An austic savant with encyclopedic memory and wizardly math skills, Raymond is also something of an emotional cripple, with little understanding of social graces or the consequences of his behavior. Some would say the same of Charlie, who hasn't gotten over the resentments of his youth but simply wallpapered over them with money. Under considerable strain, much of it self-imposed by his own arrogance and anger, Charlie decides to remove his brother from the facility that is his home and take him back to Los Angeles as a hostage; it's an impromptu negotiating tactic to shakedown Raymond's doctor for the estate monies Charlie believes he's owed. All of this drives a wedge between Charlie and his girlfriend and employee Susanna (Valeria Golino), who leaves the brothers to deal with each other. When Raymond freaks out at an airport, Charlie is forced to make a road trip with his troublesome sibling, whose daily demands include adherence to his rest home's cafeteria schedule, and appointment television like Jeopardy! and The People's Court ("Ten minutes to Wapner"). There's something indelible about Rain Man, and not only to those of us who lived through the time when it was a zeitgeist movie. Who can see the film and not remember Hoffman's verbal quirks ("Definitely") and the canny imagery captured for Levinson by director of photography John Seale, from the witty opening show of a "flying" Lamborghini (scored to the Belle Stars' nonsense ditty "Iko Iko") to the snatches of Americana on the cross-country way to the sight of the brothers in matching suits on a Caesar's Palace escalator. Then there's Hoffman's performance, which shows considerable subtlety and sly humor in addition to its evident technical perfection; it's also become fashionable over the years to point out the burden Cruise admirably shoulders here, with a typically high-energy (but never overplayed) performance that, in a sense, has to hold up more than the usual share of a two-person scene, given Raymond's emotional unavailability. "I know there has to be somebody inside there!" Charlie yells, but Levinson, Bass, Morrow and Hoffman stand firm in their well-researched depiction of autism: there can be no miracle transformation for Raymond, only baby steps at best in his reconnection to his brother. 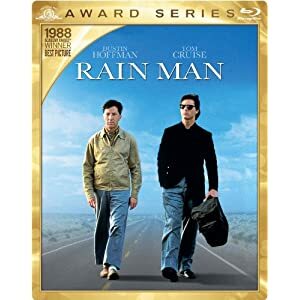 MGM's Blu-ray release of Rain Man seems to employ an early hi-def master as opposed to a freshly minted one, but the results still show a significant upgrade over previous DVD releases, and all of the bonus features from the DVD special edition have returned here, spelling a good value and a no-brainer for first-time adopters of the title. The image suffers from some edge enhancement, suggesting that DNR has been injudiciously applied, but the general impression holds true to the film's theatrical appearance, and color and detail easily trump any previous release. A DTS-HD Master Audio 5.1 surround mix certainly gets the most impact from the film's elements, which make limited but effective use of rear channels for ambience and have a fuller effect for the film's music, never sacrificing the clarity of dialogue. The previous DVD special edition extras return here, starting with audio commentary by director Barry Levinson, audio commentary by writer Barry Morrow, and audio commentary by writer Ronald Bass. These may prove a bit airy for the casual viewer, but taken as a whole, they provide a fairly comprehensive narrative of the film's development and thematic content. Retrospective making-of doc “The Journey of Rain Man” (22:07, SD) gathers Levinson, producer Mark Johnson, co-producer/actor Gerald R. Molen, Morrow, Bass, clinical social worker Diane Bass, associate producer Gail Mutrux, and composer Hans Zimmer to recall the film's production and reception. “Lifting the Fog: A Look at the Mysteries of Autism” (20:13, SD) includes comments from clinical experts, patients, and Morrow. Rounding out the disc are a clearly expendable “Deleted Scene” (2:13, SD) that's nevertheless an interesting snip and the “Original Theatrical Trailer” (2:13, SD). All site content © 2000-2019 Peter Canavese. Page generated at 04/20/2019 04:50:08PM.